This week we discuss the definition of Community and if it has changed with online and live streaming. During the Blab, I asked the same questions on Twitter. You can participate by searching the tag #PsychologyofSM and answering the questions. 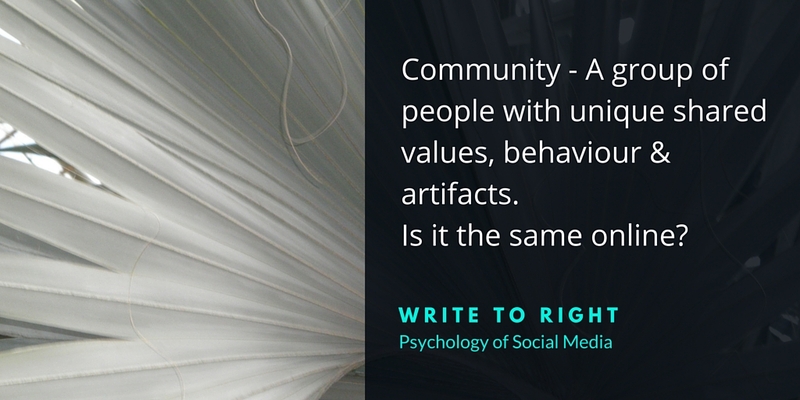 Q1 Does your idea of community differ online to in real life? Q2 Do you include your stakeholders in your community? Q3 Is Community still limited by location? Q4 What role do mobile devices have in community? Q5 Has live streaming influenced community? Q6 Do you consider the overlap of communities? Q7 How do you encourage community? Q8 How do you handle change in your community? Q9 Do you or would you outsource Community Management? There was a large discussion around spheres of influence & how we share parts of ourselves across these. Additionally, we discussed that there are subcommunities in which we participate. The major issue people came across was handling change in communities. To combat that most business owners used education and ensuring that the goals & values of the community were continued through the change. Incredibly it is having these goals & values clearly defined that is key to business owners when they engage a Community Manager for their space. Pinterest is a content curation tool. It is a place where businesses can go to collect ideas and content to share across social media, and this is how I started. But as always, it’s not about what you want to get out of the platform as a business. Key to a business’ success on the platform is understanding the behavior of their followers. This blog goes through some key technical tips & then digs into pinner behavior. Watch my video from Blab about Pinterest. In the US, 93% of users use Pinterest to plan their purchases & 96% of customers use the platform for research. Now, I am also one of these people who use the platform for research, particularly if the item is mainly American. 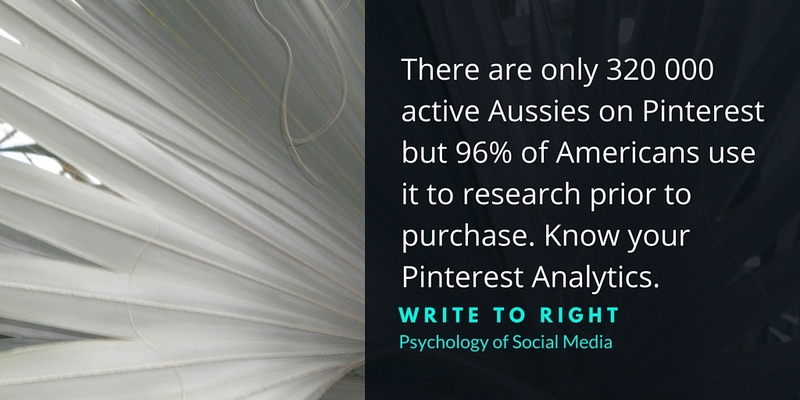 For Australian readers, I would hazard the point that unless you can sell to the US I recommend using the platform for content curation as there are only 320 000 Australian Pinterest users. There are three practical things you need to do first when establishing your Business Pinterest account. This is a 3 step process. Many people hesitate to set these up, feeling that they will then need to have their own account for their own purposes. This needn’t be the case. Having a business account then allows you to access the Pinterest Analytics. Having analytics is important not only so you can see what is popular, but also who is pinning from your site & how that’s being used. You can then use this information to develop more content or find more content around that item/subject. To see who is pinning from your site, your website will need to be verified. While for some this can mean a small change to the code (and a cost), for others using WordPress, the simplest way is to use their plug-in. These are the 160 characters you have to make an impression on people coming to your profile. It should include keywords for prospective customers & it can contain a link. You need to understand your followers’ search behavior & this is discussed below. The use of meaningful keywords can not be underestimated in Pinterest. These are the terms used by individuals to look for information, this is their search behavior. Don’t forget that pins are also indexed to Google, so I recommend using the Google Trends & Adwords tools to work out what is best for your pins (don’t forget to look at your analytics). I also encourage you to change the keywords when you repin or pin from sites. You can not guarantee that other businesses will use optomised keywords or that they will be suitable for your audience. Clear images are essential for Pinterest. I suggest using tools like Canva to create correctly sized images for your site, which will then be easily transferable to Pinterest. Make sure you include your logo in your images, you never know when it will go viral. Make sure you use one of your images (if relevant) as the board cover for your boards. This free real estate is great for your marketing, but remember it must be appealing to your audience. If I could shout one thing, it’s to remind businesses that there is a person on the other side of the screen. It is up to you to meet their needs and meet them where they are, not for them to step up to you and ask how you can help them. People use Pinterest for 2 main reasons: to Inspire & to Aspire. To succeed on Pinterest you need to do both. Your content needs to help them where they are. It needs to be useful. It needs to answer a problem. Long weekends and holiday weekends are high traffic times for pinners. As too are big sporting events. During this time businesses should be actively pinning & repinning to encourage activity on their boards and to attract new followers. While content is the key consideration for pinning, you can use group boards to expand your reach. I would encourage you not just to choose active pinners & boards, but also be active on the boards. Don’t worry if you come across something relevant to your business that you want to keep, but not share. You can have secret boards for those gems. These pins are hidden from prying eyes & competitors, so it’s handy for product research, client avatars, & future projects. When you share a belief with your client, you have a connection. You have a shared understanding, you understand each other at a certain level. It is this understanding that underpins and can begin your relationship. Perhaps it begins a dialogue. This can continue to take the form of knowing , then to liking & then to trusting each other. It then gives you a basis to influence behaviour. You are moving them along a transaction chain, moving to a sale. Watch my Scope on the topic & then continue reading for a more in depth discussion. So you need to outline both yours and your client’s beliefs. This way you know your starting points. This, along with your (incl. client’s) UVP, sets the comparison points to establish lines of communication and connections. You then grow and build upon these lines. You can strengthen these lines and connections by using testimonials and other types of social proof to reinforce why the decision to purchase from you is a great idea. You can detail benefits to reinforce why a particular item is the right choice. You discuss innovations & ask questions to invite them in to a dialogue. You get them to share themselves with your items to show that they are valued. 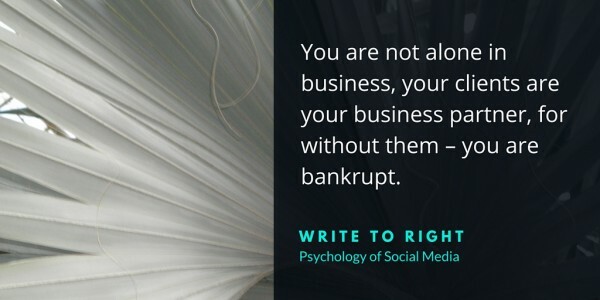 You are not alone in business, your clients are your business partner, for without them – you are bankrupt. But what if you don’t believe you are aligned or that some critical underlying beliefs are at odds? I will go into what psychologists call ‘dissonance’ at a later date; in the meantime, let me quickly show you how it’s overcome. For example, it is easier to get someone to do something, have a particular behaviour (make a purchase) if they believe that it was their idea in the first place. Go back and have a look at your client’s beliefs, then from their perspective try to align it with your own. If you can not see direct links, then look at quotes in testimonials, look at business cases; find ways to link their thinking to yours & make it their idea to make the purchase (rather than you pushing your item to them). Show them how their way & their beliefs really don’t differ from your own. Be honest, be authentic, don’t belittle or cajole. Show your clients that their beliefs do matter, that their ‘call really is important’ to you. How can you build on this in your online presence? The best place is your Frequently Asked Questions (FAQs). This list shows that you listen to your customers, that you’re interested in their concerns, & that you have solutions to their problems (not just excuses). From there you can build these into blog posts, podcasts, periscopes, YouTube videos – and increase your reach across social media, but more importantly, you help your clients to understand your beliefs structure and grow your relationship. I understand that showing business beliefs can make business owners feel vulnerable. I also understand that considering, targeting, & using client beliefs is a new and unknown way to market for many established businesses. However, with client product knowledge growing, thanks to the internet, savvy businesses will grow stronger & influential client relationships by focusing on the client & the psychological factors which underlie and drive their behaviour.